The A & B Stories: No more bullies. A pledge. 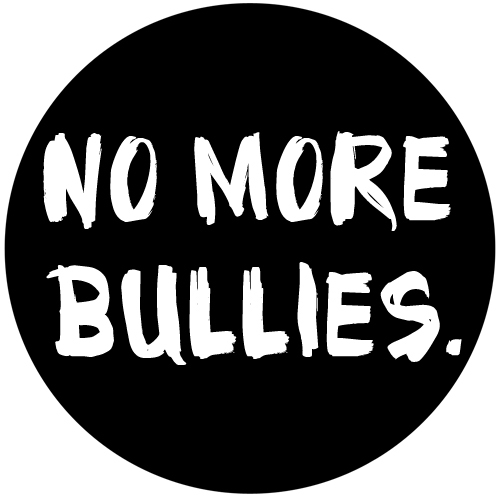 No more bullies. A pledge. The other day I posted about the Amanda Todd story, and my own experiences with bullying. It turns out that I have a little more to say on the subject. Amanda is one of many kids who have been victimized by this and have been paralyzed by the fear brought on by a bully. It's happening all the time. Not every situation leads to the same horrifying outcome, but there are still kids all over the place going through this right now. That thought made me feel so helpless. How can I do anything about it? I really can't, and many people can't because so much of it goes unnoticed. What's more is that it's not just kids and teenagers who are suffering. Bullies are all over the grown up world too. They're everywhere. At work, at home, in families, you name it. And you know what? I'm sick of it. Personally, I haven't had to deal directly with a bully since those middle school days. But the bullying I've seen, when I think about it, has never ended. I worked for a company once with a Manager who was, in a word, a bully. This person would use fear tactics and confrontation to control situations and keep everyone 'in line'. People were filled with terrible anxiety all the time, and would fear getting aggressive emails, or worse still, 'surprise' meetings which often led to unwarranted terminations. Everyone was scared to say anything, so it continued. I should have done something. I regret letting it continue. I have a friend who recently left a relationship with someone who controlled her every move, made her feel small and self-conscious in order to keep her right where he felt she belonged. She was made to feel like there was no place for her to go, and that she was to be a quiet, obedient wife to him, regardless of his treatment of her. That's bullying. And she refused to let it go on any longer (SO PROUD OF HER). People of all ages and in all walks of life are finding themselves in these situations and don't know how to get out of them. And they can be so many different scenarios. Men with wives who are bullies. Seniors who have care-givers who are bullies. It's everywhere. Thinking about all of this, the helpless feeling comes back. And I've been thinking about that for days now, trying to find some way I can feel like maybe I'm helping in some small way. So, for now, I've decided one thing I can do is to make a little pledge, and ask if anyone out there will join me in this. This is a list of promises that I am making to ensure that I don't let any bullying go on in my life or the lives of those around me. Here goes. I will do everything in my power to educate and guide my child in a direction that prevents him from ever being mean, unkind, or insensitive. Should Ben ever be accused of bullying, I will NOT look the other way and pretend it's not happening. I will NOT allow it to continue. I will not let anyone bully me in my career, social life, family life, or any other situation. I will stand up for myself. I will not stand by while anyone in my life is bullied. Be it a friend, family member, co-worker, I will stand up for them and give them the support they need. Alright friends, who's with me? If you would like to make this pledge, please do so, and spread the word. I would love to hear your stories, or your thoughts. If you think there could be more added to this pledge, let me know. yea i was bullied in elementary school, and again just a few weeks ago on the web..you know the story. Anyways it is sad that this happens and that bullies are everywhere. The main thing I want to teach Johannes is self esteem. I want him to be strong in who he is and not let bullies win. I want to teach him to stand up for who he is in a respectful manner, and show bullies that he is a better person. My parents managed to teach me that and I hope to do the same for Johannes. Now if I could only figure out a way to make the sting of finding out about the bulling less hurtful. masking it is one thing...not caring entirely is something else. I know exactly what you mean. It's so hard to be tough to it. And you said it, teaching our babies self esteem is huge. So important. It's true - bullying in the workplace is pretty common. I have worked with managers who were such mean, miserable, insecure people that the only way they felt better was to demean someone else. More often than not, they hold such power that people are afraid to speak up.